Much like how older generations would turn to someone like Andy Rooney for “hot takes” on the big topics of the day (such as “what young people are wearing” and “the rising cost of groceries”), a lot of people now look to our venerated animated comedy shows for throughly considered opinions on stuff. Shows like Family Guy or The Simpsons occasionally have something to say, but they don’t come close to the king of cartoons with a message: South Park. The 19th season of South Park is premiering on Comedy Central tomorrow night, and to celebrate the occasion the show is pulling out another big “yep, we’re talking about that” episode. According to Collider, the topic this week will be “society’s general reaction to Caitlyn Jenner’s celebrity,” and the title of the episode will be “Stunning And Brave.” According to the official synopsis, the boys will “express their utmost respect for Caitlyn Jenner” while dealing with a new principal who forces them to “confront the damage they’ve done through their history of racism and unconscious bias.” Also, it will be “the most stunning and brave South Park ever.” We’re not sure how much of that is sarcastic, but we have a hunch that at least some of it is. 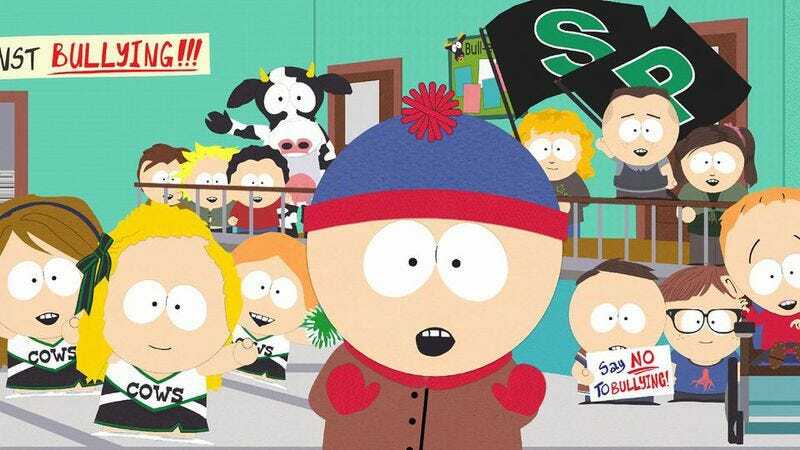 South Park returns to Comedy Central tomorrow, September 16 at 10 PM EST.